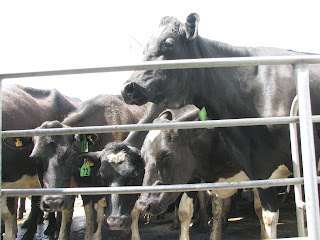 Dairy Cows have been getting a hard time in the media with catch phrases of ‘dirty dairying’ and ‘green streams’. But are scientists testing the impacts of land based effluent application on the natural New Zealand environment? It is, after all a natural product. What harm can it really do to natural ecosystems? Cows: "Don’t blame us! Just because you call it effluent, doesn’t mean it’s any less natural than sewage!" Thankfully Lincoln researchers are churning out papers on the properties, uses, and effects of dairy effluent. One of the latest by Shuang Jiang, Graeme Buchan, Mike Noonan and Neil Smith of Lincoln University and Liping Pang and Murray Close of the Institute of Environmental Science & Research studied the less widely examined property of bacteria in the form of faecal coliforms. The paper “Bacterial leaching from dairy shed effluent applied to a fine sandy loam under irrigated pasture” can be read in full in the Australian Journal of Soil Research, 46(7):552–564 (2008). Field trials considered the influence of seasonal variation (time) and soil water content (irrigation application). Trials involved the use of Lincoln University’s 6 soil lysimeters. Lysimeters are monitoring vessels containing large cores of soil. They are used for studying hydrological cycles within soil such as infiltration, runoff, and evapo-transpiration. Researchers got down and dirty collecting effluent and pouring it over the lysimeter soil. 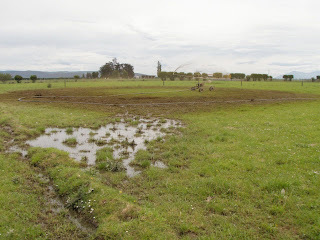 Typical soil treatment was mimicked by spray and flood irrigation, the two methods of water irrigation commonly used in the Canterbury region, and, of course, any rain that happened to fall. Researchers then watched and waited to see what, if anything, would make its way through the 700 mm depth of soil into the collection chambers for analysis. 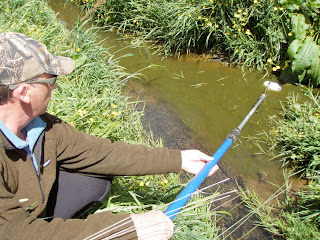 700 mm of soil did not prove to be a barrier to leaching. Analysis discovered that bacterial leachate could readily penetrate 700 mm when facilitated by water in the mock water irrigation treatments. Alarmingly, summer trials had leachates with similar concentrations to the original dairy effluent. However, researchers were able to draw some recommendations for effluent disposal without submitting to the pessimistic catch phrases I referred to earlier. With an understanding of the disposal area’s soil properties and consideration of water irrigation treatment and seasonal variations, the amount of bacteria transportation can be greatly altered. Specifically, flood irrigation resulted in higher bacterial leaching and effluent irrigated in dry summer conditions posed a greater threat of shallow groundwater contamination. 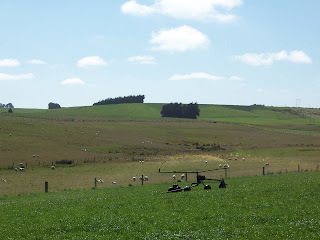 Beautiful green pastures under dairy effluent irrigation outperform the neighbouring sheep farm. So, it seems that with some careful consideration of the natural environment and ecosystem, dairy farming can prevent green streams whilst recycling nutrients. With the right conditions and management, soil acts as a natural filter of bacteria from the applied effluent before leaching to groundwater. However, this is also a warning to those that have considered only the nutrient losses from their poor practice as a pathogenic bacteria may be leaching unnoticed to your water supply right now! An example of not so careful effluent application management. This blog post was written by postgraduate student Anastazia Raymond as part of the course, Research Methods in Ecology (Ecol608).